If you’re like me then you probably have a love/hate relationship with eating out. You love the taste and convenience, but hate the cost and calories. 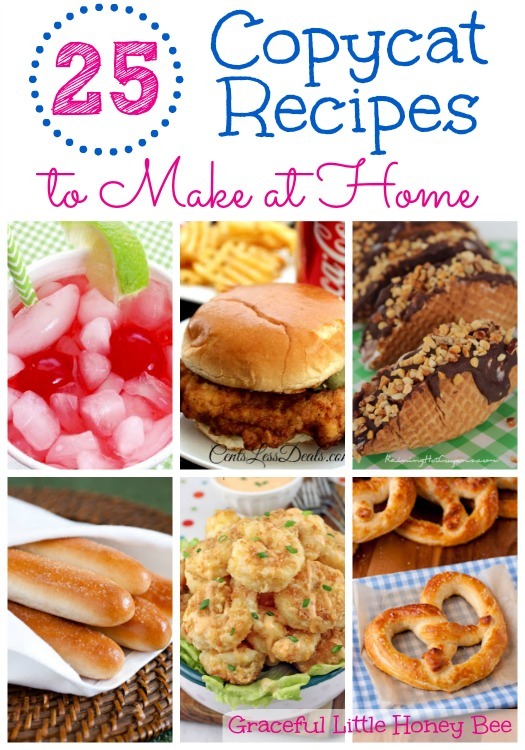 Now you can learn to make your favorites at home with this list of 25 Copycat Recipes from the best restaurants including, Wendy’s, Chick-Fil-A, Olive Garden, Auntie Annie’s and more! The best part about making your favorite dishes at home is that you will save money and be in complete control of what goes into your food. I can’t wait to dive in and try out some of these recipes, but I’m not sure where to start since they all look so good. Enjoy! What is your favorite take-out dish? Have you ever tried making it at home? I’d love to know! Love this post!! :) I've made quite a few copycat recipes before- Chick Fil A chicken sandwiches, smoothies, Starbucks drinks, Orange Julius, Panera Bread Broccoli Cheddar Soup just to name a few :) It's always so much fun, and SO much cheaper and healthier!! Thanks for all the links- I'm going to check them out SOON ;) Blessings! Oh, there's some great ones I haven't see here before... I can't wait to check them out. Thank you very much for sharing! What a great round-up! I am definitely going to try that chipotle salsa! Wow thank you so much. Am going to try this. Cust.